The Blood-Horse’s Tom LaMarra noted earlier this week that our fair commonwealth of Pennsylvania has launched a marketing campaign to make the track ‘cool’ again. I noticed an ad on philly.com on Tuesday and it prompted mixed emotions; while I was pleased to see that someone had taken the initiative to buy ad space, the ad itself is a bit confusing (and could be better placed). 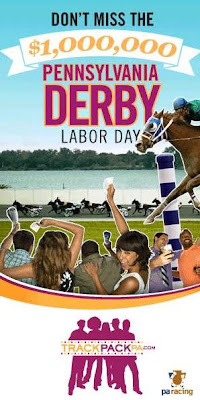 While its main objective seems to be promoting the Pennsylvania Derby (fair enough), the image (right) is one of youngish people cheering on harness racing – with part of a thoroughbred flying above their heads. I fully appreciate that PA Racing is trying to cater to both their thoroughbred and standardbred constituencies, but if the target audience is people in their 20s who have never been to the track and don’t have a clear idea of what the Pennsylvania Derby is already, this isn’t going to help them very much. Their choice of advertising venue doesn’t make much sense either, if the goal is to get a younger, presumably hipper, demographic, why choose philly.com? Beyond it hosting one of the worst newspapers I’ve ever had the misfortune to read, I would never go there to find something to do of a weekend – there are plenty of great local blogs (Foobooz, Philebrity, etc.) that do a much better job of that. Beyond that, the Track Pack website itself is a nice start, but it’s rather let down by the product. They suggest an evening out at the track for a ‘fine meal’ and ‘drinks’ but I would challenge anyone to find anything remotely resembling that at Philly Park – while I don’t expect Jose Garces to come set up shop at the track (although that would be unequivocally awesome), there isn’t even decent ballpark quality food. Citizens Bank Park has done a pretty good job of offering a range of food and drink options (indeed, the one really useful thing on philly.com is the list of what beer is available in each section of the stadium – and there are plenty of great local choices, with Victory, Yards, Yuengling, Flying Fish, Sly Fox, Troegs and Philadelphia Brewing Company widely available). Of course, you can barely see the racing at this point at Philly Park, but that’s another story – and probably a secondary concern for this particular marketing effort. One other quibble on the website front is the section with links to Twitter, Facebook et al. – rather than allowing you to follow them or become a fan, all it does is let you send the URL around – it’s a one-time shot that’s losing the chance to collect user information and maintain a regular chain of communication. You can follow them on Twitter with a little more work – you need to click to ‘join the TrackPack’ rather than use the buttons on the front page – so it’s not winning any points from a user interface perspective. However, it’s early days yet, so presumably they are still working out some of those issues. Another minor point is that if the hipster crowd is, indeed, the goal, the models could have been dressed a little more Northern Liberties, rather than South Philly (although I was getting a bit of a Jersey vibe as well); I may not be a fan of the annoying porkpie hat myself, but I suspect their wearers may be more susceptible to the allure of a Rat Pack-esque night out. That leaves the other problem – there’s no good way to get to Philly Park from the city (or most of the suburbs) without driving – and if I’m going to drive to the track anyway, I tend to go to Delaware Park. True, the food is still terrible (there is one halfway decent beer stand, which is better than nothing), but the atmosphere is so much better – it’s a racetrack that happens to have a slots parlor attached, but I never need to see the casino portion of it. Philly Park doesn’t give the impression that racing is still terribly important – and judging by their own website, they don’t care if you can’t get there via public transit (which is handy, because it’s not a viable option). So while the Track Pack is a useful notion, it would be much better served (at least locally) by a real effort to make the track itself more appealing – partner with a good beer distributor, get in a real catering company and make getting to the track less difficult. Marketing to new fans is certainly welcome, but if their first visit doesn’t impress them, it’s a wasted effort. For existing fans, the above would be very much appreciated – as would a better space to actually watch the racing, which, surely, is the whole point of the operation in the first place. I love the mix of your local knowledge with a national view of marketing issues in racing.